Weddings design aids the newlywed in designing and creating their dream wedding. This opportunity only occurs once in a lifetime, might as well do it perfectly, and that is what we believe. Being resourceful and present during the whole planning process are Weddings Design’s key focus points. Our Morocco wedding planner agency is available at all times; and will be right by your side, whenever you need us. The Marrakech wedding planner website provides all the information you will need in order to contact us. During every step, our Marrakech wedding planner agency will be available – until you’re pronounced husband & wife. The most romantic places in Marrakech is what you should expect. 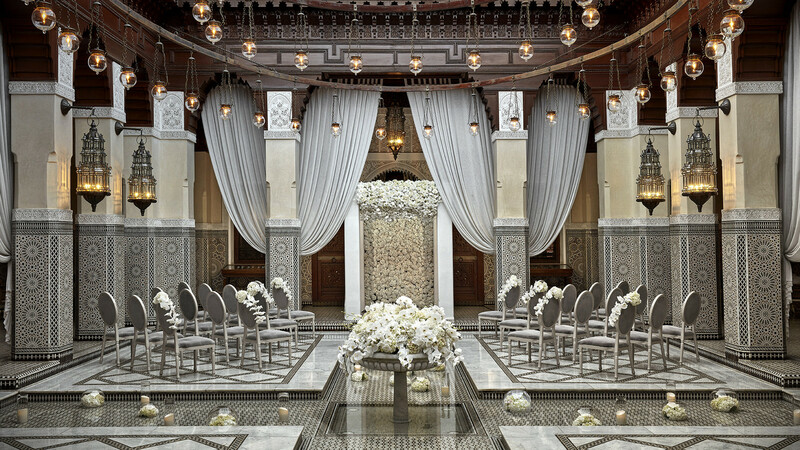 Carefully selected Marrakech wedding venues that will give your night an enchanting vibe. Whether it’s an intimate declaration of love or a lively party with many guests; our Marrakech wedding planner agency will surely take care of your magical day. Weddings can be planned throughout Morocco. We will be helping you and suggesting the ultimate venues; where your idea of a dream wedding can come to life. Weddings Design offers you an endless romantic sea of wedding options. And our wedding agency in Marrakech always makes sure to go above and beyond to fulfill your dream wedding. We will contact artists, hire orchestras, and collaborate with high-end tourism companies – to provide you every necessity. It all depends on your vision of a perfect wedding. Our Morocco wedding planner agency will take care of the regulations; and help you think broadly. Weddings design will be present for the whole journey. Your wedding will bring joy to everyone present!